Petrified wood occurs throughout the United States, but some of the most abundant and highest quality examples of these fossils occur in Petrified Forest National Park in eastern Arizona. The park was established as a national monument in 1906. Initially set aside to preserve fossil wood, the area has yielded other prehistoric treasures too. 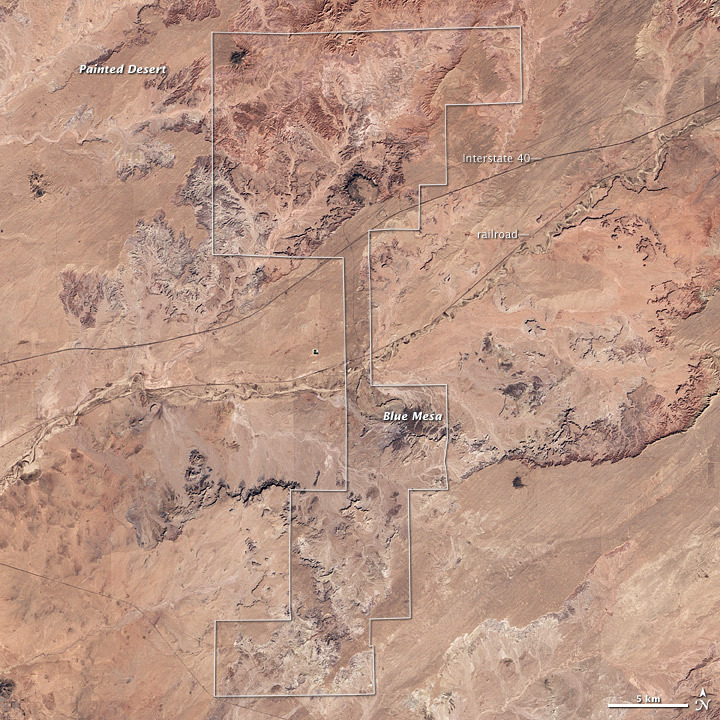 On November 28, 2002, the Enhanced Thematic Mapper Plus on NASA’s Landsat 7 satellite captured this natural-color image of Petrified Forest National Park in eastern Arizona. White outlines indicate park boundaries, and thin lines show where a railroad and interstate pass through the park. Sunlight shines from the southeast, casting almost-black shadows on the northern and western slopes, but earth tones dominate this arid area. Colors range from pale pinkish beige to deep rust. In the northern part of the park, the Painted Desert occasionally gives rise to colorful dust storms. To the south, the Blue Mesa region features hoodoos—otherworldly spires topped with big rocks. Petrified Forest National Park preserves traces of an ancient, vastly different landscape. Some 225 million years ago, during the Triassic Period, this area rested near Earth’s equator, part of the massive supercontinent Pangaea. Hot and humid, the region was dominated by a huge river system, where horseshoe crabs left footprints in soft stream- and lake-bottom mud. Crocodile-like reptiles; armored, plant-eating reptiles; and Coelophysis—dainty, fleet-footed, meat-eating dinosaurs—all lived here. As the park’s name indicates, however, its foremost fossils are petrified logs. Lining abundant waterways, ancient trees occasionally fell into the flowing water, perhaps blown down by winds or killed by insect infestations. While many of the trees rotted away, some were buried by the quick-moving water. When winds carried ash from distant volcanoes, minerals from the ash infiltrated the wood, forming crystals. Crystals occasionally replaced individual cell walls, preserving the petrified wood in detail. Iron and other minerals lent rainbows of color to the petrified trees. Brittle petrified logs often broke into pieces, giving the illusion of ancient trees having been deliberately sawed into segments. Over millions of years, newer sediments buried the landscape from the early Triassic, and plate tectonics carried the region away from the equator. But movements in the Earth’s crust also uplifted this area as part of the multistate Colorado Plateau. Younger sediments eventually eroded away, revealing remnants of a vastly different ancient environment. NASA image created by Jesse Allen, using park boundary geographic data (GIS) provided the U.S. National Park Servce and Innovative Technology Administration’s Bureau of Transportation Statistics, and Landsat data provided by the United States Geological Survey. Caption by Michon Scott. Acquired November 28, 2002, this true-color image shows an arid landscape in eastern Arizona. At the time of the earliest dinosaurs, it was a moist, tropical region near the equator. National Park Service. (2009, September 16). Petrified Forest. U.S. Department of the Interior. Accessed October 2, 2009.